The US automotive sector is performing well, with new car sales approaching pre-recession levels, driven by the robust economic performance and improved consumer confidence. The aftermarket segment remains stable, aided by lower fuel prices. Gross margins of automotive businesses are expected to remain stable in the coming months as the industry benefits from lower raw material prices. However, at the same time there is some headwind from a stronger USD. The average payment duration in the US automotive industry ranges from 30 to 60 days. Payment behaviour in this sector has been rather good over the past two years. The number of protracted payments, non-payments and insolvency cases is low. Given the positive performance outlook, we expect the current insolvency rate to remain stable. Due to the generally benign indicators, we assess the credit risk and business performance of the automotive sector to be good, and our underwriting stance continues to be open. However, we generally have a neutral underwriting stance on the alternative fuel vehicles segment, which is currently impacted by low oil prices and a lack of infrastructure/charging points. The US construction sector is benefiting from robust household consumption as demand for new housing is increasing. Non-residential construction also showed satisfying performance. That said, downward pressure on many businesses´ revenues remains, and increasing salaries, healthcare costs for staff and miscellaneous expenses continue to tighten margins. Banks are principally willing to lend to the construction industry, but only for viable and promising projects. 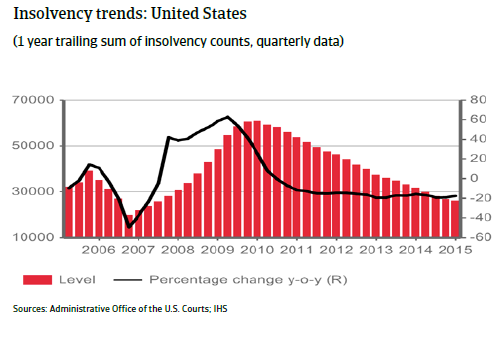 Construction insolvencies have continued to improve overall in the US in 2015, however, small businesses in the industry are generally still paying later and have higher bankruptcy rates and more delinquent debt than other industries. The decreasing trend in insolvencies is expected to continue in the coming months. Due to the positive development, we have steadily increased our cover for this industry over the past few years. The general outlook for the US retail and consumer durables industry remains positive, given the continued increase in US consumer spending. Home products companies generate about half of the consumer durables retail sector´s revenue and operating profit. 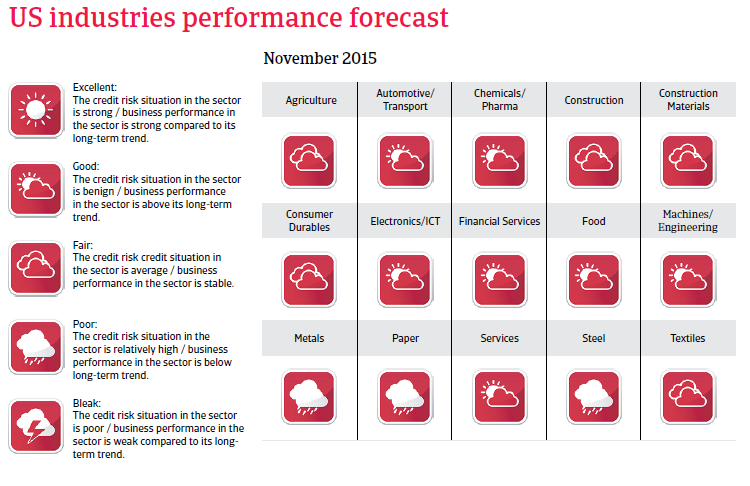 Specific industry subsectors may be viewed more positively than others, e.g. solid home sales should support demand for furniture and other home goods. Online sales, which average about 5% of total sales, are expected to remain the fastest growing segment of the retail industry and shift the retail landscape. Merger and acquisition activity will remain high as companies seek to turn their stable margins and stronger balance sheets into enhanced product portfolios with greater geographic diversity. Despite the generally good outlook for consumer durables retail, there is always the risk that sales prices may suffer if demand unexpectedly slows and competition intensifies. While high earners continue to spend, thanks to gains in the housing and equity markets, many lower and middle-income consumers still remain cautious, partly due to the rising food and healthcare costs. Despite the general upswing, the consumer durables retail sector continues to be characterised by increased competition and continued price and margin pressure. Therefore, businesses within the industry should be carefully evaluated and liquidity should be closely observed. Currently, the revenue performance of the US steel and metals sectors is negatively affected by the lower cost of imported (Chinese) steel and decreasing demand from the oil/gas industry, which suffers from the oil price decline. The latter particularly affects the oil country tubular goods (OCTG) sector. Profit margins of steel and metals businesses have decreased over the last 12 months due to the negative impact lower import pricing has had on the sector, and this declining trend is expected to continue. Competition is increasing, as companies try to expand their regional reach (local to regional, regional to national) in order to find new business and increase revenues and profits. Financing requirements and gearing are generally high in this industry. Payment delays and defaults have increased and are expected to rise further, as the cash flow of end-buyers has been impacted by lower growth, especially in the OCTG sector. Insolvencies have increased in the OCTG-related segment and are expected to increase further in 2015, by about 10% - 15%. 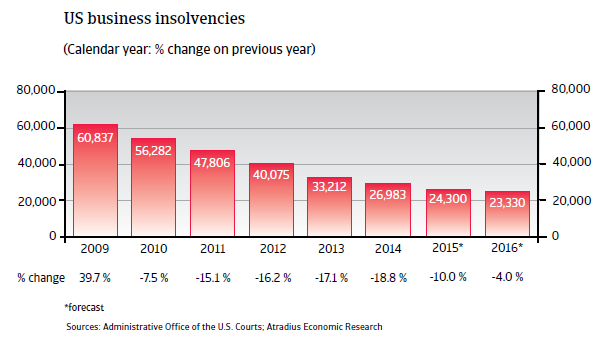 After sharp year-on-year increases in 2008 and 2009, the number of corporate insolvencies has steadily decreased every year since. According to figures provided by the US Courts, the number of business bankruptcies filed in Federal Courts declined 18.8% year-on-year in 2014, to 26,983 cases. We expect this positive downward trend to continue in 2015 and 2016 due to the anticipated continuation of economic growth (see economic report below). However, the pace of decline in insolvencies is forecast to slow down. The US economic rebound is expected to continue. 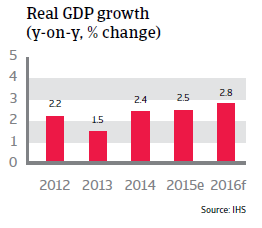 Following the 2.4% increase in GDP in 2014, a growth rate of 2.5% is expected in 2015, and 2.8% in 2016. While US exports are hampered by the strong USD, the shale gas sector faces serious problems. However, this is more than offset by increasing investment, lower energy prices, robust consumer spending and an improving housing market. That said, downside risks have increased over the last couple of months due to increased volatility in the world economy. Consumer confidence has increased considerably since early 2014, and after a surge in 2014 household consumption is expected to increase 3.1% in 2015 and 3.2% in 2016. As consumer spending accounts for more than two-thirds of US GDP, this increase should be a major contributor to the expected robust GDP growth rates in 2015 and 2016. Consumer wealth has been boosted by increasing home prices. The collapse in home prices was one of the causes of the 2008 financial crisis. Prices began falling in 2006 and did not stabilise until 2009. The recovery in prices started in early 2012 and continued into 2015. Home sales are still benefiting from lower prices in many areas and low mortgage rates. Home owners who have seen their equity rise will be more likely to borrow and spend while, at the same time, delinquency rates should stabilise. Household finances continued to improve in 2014 and 2015, with consumers reducing their debt and improving their debt-to-income ratios. Net wealth is also better, thanks to both lower debt and higher asset values, on investments such as housing and securities/stocks. This provides a solid foundation for further growth in consumer spending. Another important factor for rising consumer confidence and spending is the lower unemployment rate, which decreased to 6.2% in 2014 and is expected to decline further to 5.4% in 2015 and to 5.2% in 2016. Job security has increased and nominal wages have finally begun to tick up, albeit modestly. Wage growth is expected to continue improving in 2016. Additionally, household consumption is aided by the strong USD, low inflation and low interest rates. Due to the low interest rate environment US consumers have increased their purchases of big-ticket items like cars and houses. The US consumer price index (CPI) is forecast to decline to 0.1% in 2015. The CPI has decreased since mid-2014 as a result of declining oil prices. The decrease in oil prices is, on balance, positive for the US economy. Due to a strong increase in production over the past couple of years, the US is currently self-sufficient in oil. While the lower oil price reduces the profits of producers, it benefits consumers, who are more likely to spend the extra money. However, a downside risk for household consumption growth in 2016 could be larger stock market volatility, given the relatively high exposure to equities through investments and/or retirement savings. US companies are expected to continue to benefit from low financing costs as it is anticipated that the Federal Reserve will be cautious in raising interest rates later this year with inflation being low and the value of the dollar rising. However, the strong USD continues to hurt US export businesses, with their profit levels decreasing further. US exports contracted in H1 of 2015, partially due to the fact that the increasing strength of the USD hurts the international competitiveness of US exporters. In real effective terms, the USD has appreciated more than 10% since mid-2014. There is decreased demand for US exports in key markets like Canada (whose currency has depreciated sharply against the USD) and China, where economic growth has slowed down. This adverse development mainly affects the manufacturing sector. 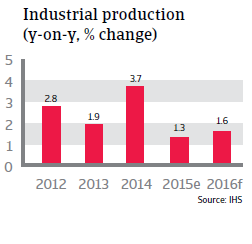 Industrial production growth is expected to slow down in 2015 and 2016. 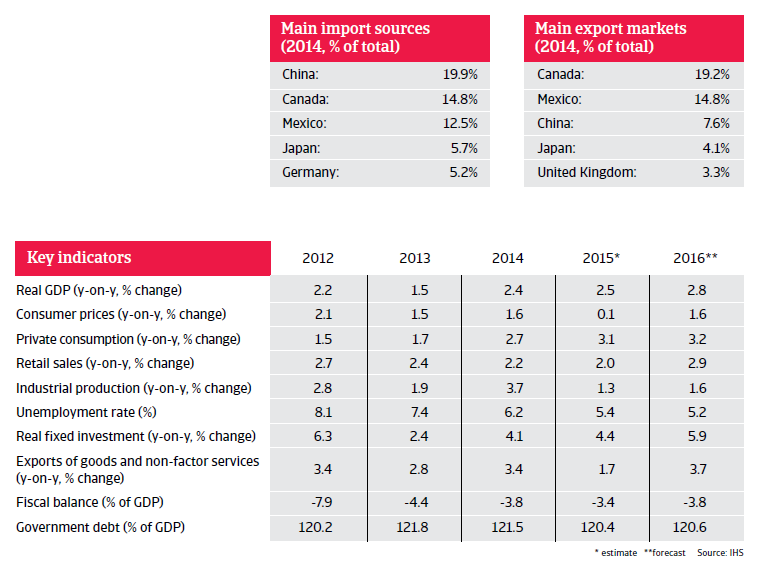 After a low growth rate of 1.7% in 2015 exports are currently expected to grow 3.7% in 2016. However, this forecast could prove to be overly optimistic if the USD appreciates further and external demand from emerging markets continues to decrease. In the first half of 2015 business investment remained subdued as the US energy sector adjusts to the low oil prices. However, investment in business equipment has recovered in Q3 of 2015 indicating businesses are optimistic in the face of weak external conditions. 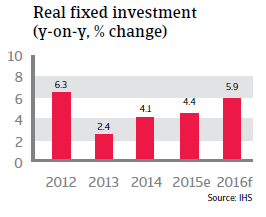 Real fixed investment is expected to grow 4.4% in 2015 and even by more than 5% in 2016. However, capital spending in the oil sector will remain subdued due to the plunge in oil prices. An interest rate increase in early 2016? Throughout the first half of 2015, the continued robust GDP growth cemented predictions that the Federal Reserve (Fed) would raise the low interest rate of 0.25% set in September 2015. However, uncertainty regarding the global markets and its potential effects on US growth has motivated the Fed to delay an interest rate increase again in its September and October meetings. It remains to be seen if the Fed will still increase interest rates in 2015, given the more volatile global economic environment and the low inflation rate, which currently is still far below the Fed´s 2% target. At the same time, despite decreasing unemployment, the labour market is still not performing at a level strong enough to offer enough confidence to pursue a rate hike. The labour participation rate has steadily decreased since 2008, to 62%, the lowest rate the US has seen since 1977. This decline can be partially attributed to changing demographics (the aging population). Lower participation in the labour force is a significant driver of declining unemployment, so until these numbers become more robust, the Fed is likely to remain hesitant. With diminished threats of external shocks for the US economy, inflation is expected to increase again while the wage growth and the participation rate in the labour force are forecast to improve in the coming months. This would lead to the Fed increasing interest rates in late 2015/ early 2016. As a result of the 2008 financial crisis, both government debt and the budget deficit increased sharply from 2009 to 2011. 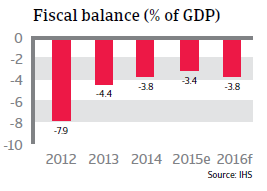 After reaching 4.4% of GDP in 2014, the budget deficit is expected to decrease in 2015, to 3.8% of GDP. However, government debt remains high, at 120% of GDP. The political struggle over government finances still remains a potential risk to the US economic outlook in the mid and long term. The dispute between Republicans and Democrats in the US Congress over government policy and the fiscal budget led to a temporary shutdown of the government in autumn 2013. Congress has not yet reached a long-term solution, and the unwillingness to make concessions has proven to be a stumbling block to comprehensive budget consolidation. That said, end of October 2015 the Republicans in the US Congress have reached a compromise budget deal with the White House to avert the prospect of a renewed government shutdown. This agreement will last until March 2017. The agreement raises the debt ceiling and increases the budget. The tubular goods segment is hit hard by the end of the oil boom, with insolvencies expected to increase.